Wheelchairs for dogs have really improved in recent years and there are many more brands to choose from now. These can be a great addition to your dog’s recovery from surgery or injury; and for some dogs whose rear limbs don’t work well (but the rest of their body is fine) they can be life changing, enabling them to still go for a walk and have independence to toilet unassisted. Myth: Putting My Dog In A Wheelchair Means He Will Never Walk Again. Unfortunately this is an all too common comment we hear from pet owners and vets. Wheelchairs are seen by some as ‘giving up’ or a ‘last resort’ after rehabilitation has failed to get a dog walking again. This is nonsense! As a physiotherapist, it is my aim to remove pain and restore mobility and quality of life. If you had a broken leg, I would give you a set of crutches to make you mobile. If you were wanting to go longer distances, or both your legs were affected, I would give you a wheelchair so you could still get out and enjoy life. You would certainly still be going to rehabilitation, with the aim of getting you back to walking independently. Assistance of gait actually forms a very important part of the whole rehabilitation process. So I am pro-wheelchairs, but rehabilitation MUST still be performed. 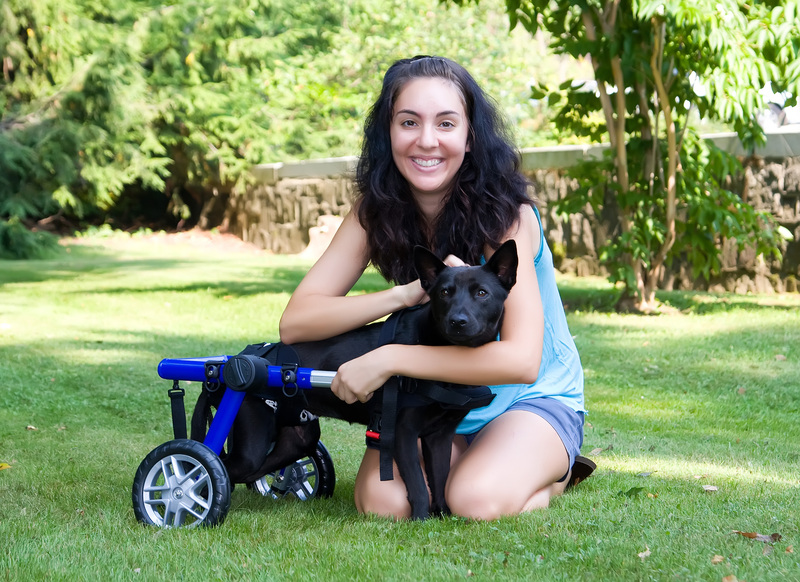 Some Considerations: Is A Wheelchair Right For You and Your Dog? While I am pro-wheelchairs, they certainly won’t suit every dog or every owner. To begin with, dogs can’t be left in wheelchairs for extended periods of time. They are really only used when ‘going for a walk’, or for supervised periods in the yard. In most cases they can’t lie down, or if they do work out how to lie the front half of the body down, undue stress is then placed on the spine. Dogs must always be supervised in case they get their wheels stuck or tip over and injure themselves further. The dog must be able to manoeuvre the chair around. If the wheelchair is for weak hind limbs then the front limbs must be strong enough to move the chair around, with minimal arthritis in the front limb joints. You must be able to lift the dog in and out of the chair: If it is a large dog, then you must be physically able to lift your dog in and out of the wheelchair 1-2 times per day. Use of a harness on your dog can certainly help with this. In our clinic we recommend the ‘Help ’em up harness‘ for this purpose. If a dog is severely affected neurologically and we expect recovery is going to be prolonged, then this dog may be crated or penned for many, many months, only getting to walk when we assist with a harness. Putting them into a wheelchair means they can go for a walk, enjoy life and have a more ‘normal’ existence, while relieving the owner from carrying the dog on the walk. Legs may either be up in stirrups for protection, or if there is some motor function in them, down on the ground so they can still ‘walk’, with or without boots for foot protection. Many of my patients with spinal surgeries in the middle of the back have actually improved when they have gone into a wheelchair, as we have helped to support them in an upright position, allowed them some freedom to be a normal dog again and go for a walk. Again rehabilitation is still very much necessary but a wheelchair can be an invaluable tool for these patients during recovery. We can even perform many of our standing exercises in the wheelchair. 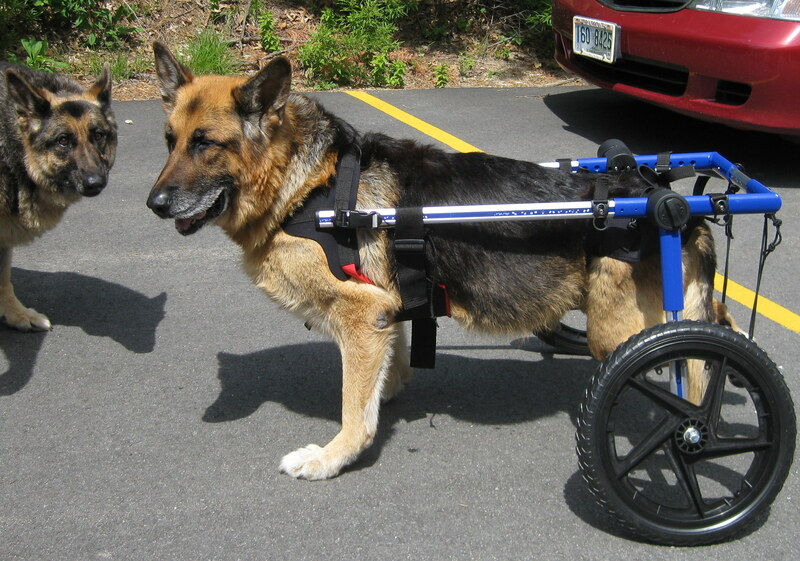 Not only dogs with neurological conditions should be considered for wheelchairs. If your pet has arthritis that really affects their mobility and ease of going for a walk, then a wheelchair may make life much easier for them. They may still potter around fine at home and in the yard, but if going to the park would typically make their affected limbs sore, then you could consider a wheelchair for your dog. Again, think about if you had a really sore knee, or your granny had a really sore hip, as a physiotherapist I would prescribe a walking stick, crutches or walking frame to keep the person mobile while unloading the painful limb- not tell them to stop walking! It is not ‘cruel’ to put a dog in a wheelchair- it’s actually cruel to deny them a better quality of life and reduction in pain if we have the means to do it. 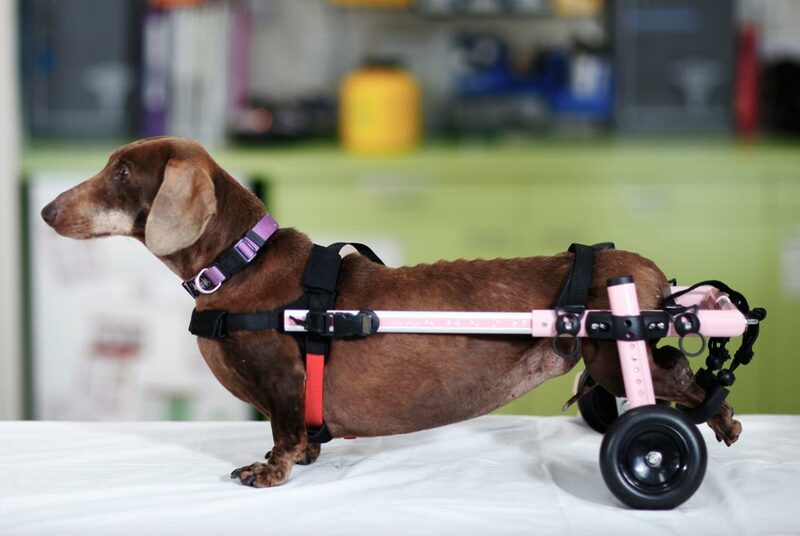 Similarly, we certainly can consider a wheelchair after orthopaedic surgery or injury, to unload a painful and healing structure, while still allowing the dog have a normal walk. At what time frame this could occur after injury, and whether affected limbs can be weight bearing or need to be held off the ground, does vary from dog to dog. This would need to be assessed for suitability by a physiotherapist. A dog with an amputated limb will typically ‘manage’ getting around quite well, but not without extra load placed on the other limbs and spine due to the massively altered body posture. The load that is placed on the remaining front or rear limb depending on where the amputation is, will be greatly increased, causing this limb to be more susceptible to injury. A wheelchair can be a valuable addition to an amputee for their exercise sessions to allow them to run and play without loading up the opposite limb excessively, and thus helping to protect it from injury. Exercise duration can also be increased with the reduced load on the other body parts. So if you think a wheelchair may be worthwhile to help your dog to get around better, check out our wheelchair page on the website or give us a call at the clinic on 03) 9553 0896 and we can discuss the needs of you and your dog.